Oh no! That transfer truck just threw a rock from the tire. Unfortunately, the rock cracked your windshield. Now you cannot clearly see where you are going. Fortunately for you, there is help that is just a phone call away. It could be a rock. Maybe a freak hailstorm came before you could get your car home to the garage. In a worse-case scenario, your windshield has that spider web crack from a neighbor’s BB gun. You only know one thing for sure- you need that windshield fixed fast! 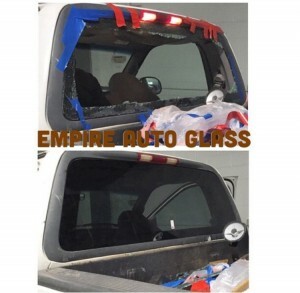 Be assured that when you call Empire Auto Glass you will get quality service. Our technicians are trained and certified. Services are available day or night. If you need us, we will be there. Our mobile service is also perfect for roadside repairs. If your windshield is damaged on the road, pull over and call us. Don’t drive any further, risking worse damage. Definitely don’t take that chance on a cracked windshield impairing your driving and causing an accident. Even a broken rear windshield should be repaired immediately. The main reason that people wait to repair cracks and chips in their windshields is due to costs. Money is tight. You think you can ‘make-do’ with a chip in the windshield until you get the money to repair it. What you may not know is that most insurance companies will pay for the repair. They would much rather pay for a chip than cover the costs of a whole new windshield. At Empire Auto Glass, we work with a variety of insurance providers. We can fix your windshield without hurting your wallet. You may not have to pay any out-of-pocket costs to fix it. Perhaps your problem has nothing to do with money. You don’t even question whether or not the windshield needs repairing. Instead, your problem is time. You cannot afford to take time off of work and take your car to the shop. You choose the time and place of repair as we provide mobile service to serve you at your location of convenience. For more information on windshield replacement or to schedule an appointment, call Empire Auto Glass at 703-573-7700 or 301-830-6262.